For over thirty years, Mark and Julie Phillips have displayed a striking skill for discovery, from one of a kind treasures to new trends. Starting in Southeast Asia and continuing on to Africa, Latin America, Europe, and the Pacific Rim, they've searched the world for exciting products for their design-oriented customers. Today, Phillips Collection continues to define global style for the contemporary market. With the same spirit of innovation, they discover design and designers, and match them with an incredible range of production resources developed over decades of travel. Phillips Collection thrives on market-driven execution of innovative new concepts. With new categories and new materials, each market features products that can't be found anywhere else. Taking ceramic vases into the realm of sculpture, creating striking combinations of unexpected materials, and bringing a designer's eye to a museum collection, Phillips Collection is the conduit for a wide range of fresh ideas filtered through a sense for the market. 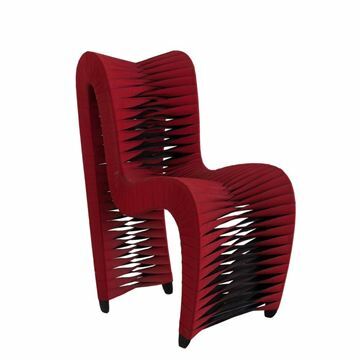 The Seat Belt Chair by Phillips Collection, shown in Red color way. Our Seat Belt chairs are stylish, comfortable…and safe! Ergonomically shaped to conform to your body and sit very comfortably. Each piece utilizes cleverly colorful seat belt straps, which is how the collection got its name. This award-winning collection has appeared on the big screen in feature films like Hunger Games. The Seat Belt Chair by Phillips Collection, shown in Orange color way. Our Seat Belt chairs are stylish, comfortable…and safe! Ergonomically shaped to conform to your body and sit very comfortably. Each piece utilizes cleverly colorful seat belt straps, which is how the collection got its name. This award-winning collection has appeared on the big screen in feature films like Hunger Games. The Seat Belt Chair by Phillips Collection, shown in White color way. Our Seat Belt chairs are stylish, comfortable…and safe! Ergonomically shaped to conform to your body and sit very comfortably. Each piece utilizes cleverly colorful seat belt straps, which is how the collection got its name. This award-winning collection has appeared on the big screen in feature films like Hunger Games. 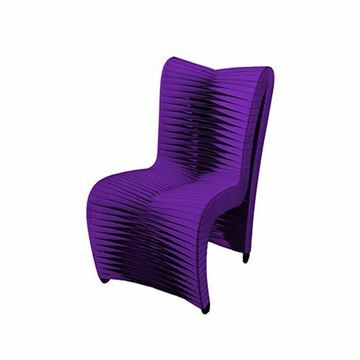 The Seat Belt Chair by Phillips Collection, shown in Purple color way. Our Seat Belt chairs are stylish, comfortable…and safe! Ergonomically shaped to conform to your body and sit very comfortably. Each piece utilizes cleverly colorful seat belt straps, which is how the collection got its name. This award-winning collection has appeared on the big screen in feature films like Hunger Games. The Seat Belt High Back Dining Chair by Phillips Collection, shown in Purple color way. Our Seat Belt chairs are stylish, comfortable…and safe! Ergonomically shaped to conform to your body and sit very comfortably. Each piece utilizes cleverly colorful seat belt straps, which is how the collection got its name. This award-winning collection has appeared on the big screen in feature films like Hunger Games. 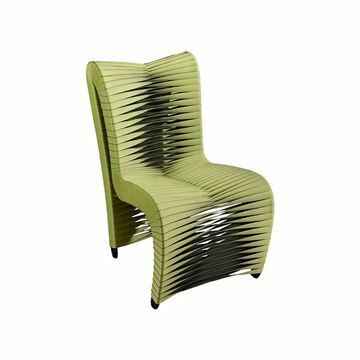 The Seat Belt High Back Dining Chair by Phillips Collection, shown in Green color way. Our Seat Belt chairs are stylish, comfortable…and safe! Ergonomically shaped to conform to your body and sit very comfortably. Each piece utilizes cleverly colorful seat belt straps, which is how the collection got its name. This award-winning collection has appeared on the big screen in feature films like Hunger Games.